Humpback Whales have deep roots in Hawaii’s cultural and marine history. Viewing them on Maui is not only a great reason to travel to Hawaii, but a rare life experience that will not be soon forgotten. Although the North Pacific Humpback Whales are mammals, seeing them in person might be the closest you’ll get to seeing a ‘living dinosaur.’ Scientifically, it’s believed that prehistoric cetaceans (whales and other swimming mammals) existed during the Late Eocene period, approximately 35-40 million years ago. In fact, even though Humpback Whales may look like dinosaurs, sadly, they are not. In truth, they have a closer relation to humans. Adult whales are quite large, and the fifth largest whale species in the world. They can grow up to 65 feet in length and can weigh anywhere between 50,000-80,000 pounds (25-40 tons). The females weigh in as the largest, and newborn whales weigh approximately 1-ton at birth. So, you can imagine that a chance sighting of a Humpback Whale is indeed majestic. From a boat, or on the shore, observing a Humpback in its natural environment is nothing short of a god-like experience. In the ancient Hawaiian culture, the whale, also known as ‘kohola’ is considered an aumukua (ancestor). The aumukua were mystical and spiritual creatures celebrated for their strength and mana (energy). Throughout the Hawaiian islands, archeologists have found ancient petroglyphs that depict whales in Hawaii. It’s believed that the kohola have been visiting Hawaii since ancient Polynesia, approximately 100-600 AD. Some of the oldest found petroglyphs in Hawaii are believed to be dated back to 1300 AD. As you can see, Humpback Whales are not new visitors to the oceans surrounding Maui. The North Pacific Humpback Whales travel from Alaska to Maui oceans every year for their annual winter migration. In fact, some whale pods from Alaska travel to Maui and some travel towards Mexico. Through tracking, marine professionals believe that the same pods of whales travel to Maui every year confirming that these whales are actually part-time Hawaii residents. The whales travel to Maui to escape the cold winter waters in Alaska; seeking Hawaii’s warmer waters for both breeding and birthing. Before leaving Alaska, Humpback Whales fill up on their favorite foods; krill, anchovies, capelin, cod, and more types of schooling fish. They do this to gather strength for their journey because they do not eat while they are in Hawaii. Humpback Whales can be seen in Alaskan waters during the late spring, summer, and early months of fall. Their feeding grounds extend from Washington State to the Chukchi Sea and can be viewed in the chilly waters of the Aleutian Islands, Prince William Sound, Glacier Bay, and the Barren Islands between Homer and Kodiak. If you visit the Humpback Whales in Alaska during the summer months, the temperature will not be freezing, but it will be quite chilly! With coastal temperatures that decline to 25-degrees Fahrenheit (with a serious wind chill), plan on bringing a parka, hat, scarf, and gloves while viewing the whales. Or, you can visit Humpback Whales in their Maui home! Aboard a Maui whale watching tour, or from the shoreline, you’ll just need a few casual beach supplies; a swimsuit, sunglasses, a hat, smartphone for pictures, and reef safe sunscreen. When planning a trip to see whales on Maui, know that it’s also possible to enjoy a snorkel tour at the same time. Aboard an ocean vessel, whale watchers can explore Maui’s oceans in search of colorful and vibrant reef formations. With an expert captain and experienced guides, travelers can learn how to safely snorkel, explore Maui’s reefs, see tropical fish, Hawaiian sea turtles, spinner dolphins, manta rays, and more. 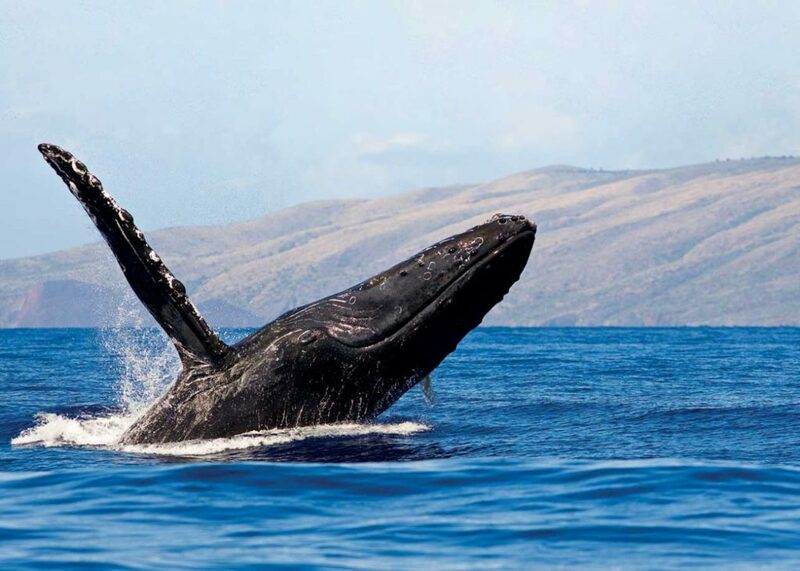 While traveling to a snorkel destination aboard an ocean vessel during Maui’s winter months, whales can be seen in abundance. Guests can observe the whales’ unique surface behaviors such as blowing, flukes; tail slaps, head lunges, and breaching from the comfort of a guided tour. It’s truly awe-inspiring! Learning about the unique behaviors of Humpback Whales is one of the most amazing experiences while enjoying Pride of Maui whale watching. When the Humpback’s reach Maui, some of the females are preparing to give birth, and some are preparing to breed. The annual cycle is super interesting because the females that are ready to birth their calves are the same females that were breeding in Maui’s waters during the previous year. When traveling from Alaska to Hawaii, whale pods travel together during their 3,000-mile one-way journey. It’ s believed that 8,000-10,000 Humpback Whales visit Hawaiian waters every year. ‘Male escorts’ guide the pods to Hawaiian waters in an expedition that takes 6-8 weeks. When the pods reach Maui’s waters, the majority of them settle into the warm and protected waters between West Maui, and Maui County’s outer islands of Lanai, Molokai, and Kaho’olawe. These areas are better known as the Alalakeiki, Kealaikahiki, Auau, Kalohi, and Pailolo Channels. With shallow depths that can be a mere 252 feet, Maui’s surrounding oceans are like a calm and comfortable bathtub for the Humpback Whales. Humpback Whales sing! The whale song is a technical, and complex series of sounds that have been closely compared to a classical concerto. Although female whales can vocalize, it’s the male bulls (that some scientists believe do not breed) that are responsible for these incredibly cycled marine ballads. Exact reasons for the whale song are unclear, with ideas that range from seducing and courting mates, symbolizing movement and exploration, and projecting strength, pod protection, and vitality. The United States listed the Humpback Whales (Megaptera novaeangliae) as endangered under the Endangered Species Act (ESA) of 1973. Due to previous and worldwide commercial whaling practices, Humpback Whale populations were at a historical decline. You can learn more by checking out this BBC Article/Japan Whaling. Later, in 1985, the International Whaling Commission (IWC) got on board and released a whaling moratorium which has helped to increase the international population of this beloved marine species. In late 2018, Japan announced that they were leaving the International Whale Commission to once again “resume commercial whale hunting.” As you can see, as a species, the North Pacific Humpback Whale is still threatened and in need of protection and conservation measures. Humpback Whale population has increased over the years due to protection efforts that are still in place by agencies like the NOAA (National Oceanic and Atmospheric Administration) Fisheries, EPA Hawaii (Environmental Protection Agency), and the National Wildlife Federation. Conservation efforts are also huge with organizations involved like WWF, Sea Shepherd, Whale Trust Maui, Hawaiian Islands National Marine Sanctuary Advisory Council, and the University of Hawaii. Visiting Humpback Whales in Maui offers many incredible life opportunities. It’s the perfect environment for observing whales in their natural environment, learning about their behaviors, and taking part in conservation efforts.